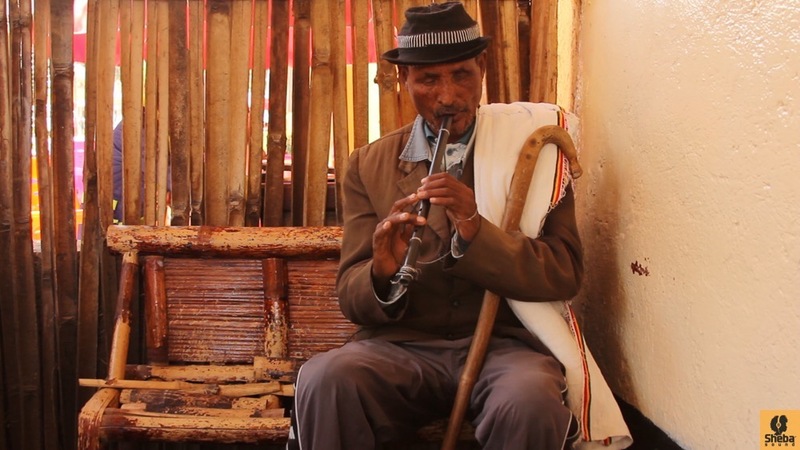 While we were recording in Gondar, we came across a blind old man walking very slowly along the street, playing his washint – a wooden flute. The music that he was producing was ethereal. We asked him if he would be interested to tell us about his work, music and life experiences. We sat down with cameras and microphones on the terrace of the local music house and listened to his story. My name is Weldie Almaw, I am around 58 years old, and I live by begging for alms, I have no other occupation. I have no home; I live with people that have taken me in. I have children. I earn my living through begging. I have no other means, and this is how I have come along so far. I lost my sight in childhood. And if you ask me how I learned to play the washint, when I lost my sight at the age of seven and was sitting around with a bowed head, my father, may God bless his soul, came up with a way for me to move my thoughts around. Like the French Luis Braille, he carved out letters for his blind son, my father carved out a washint and gave it to me saying “as you are not going to school, move about your thoughts through this”, and that’s the reason I learned. So this is one. Then I learned the songs around me in childhood that our fathers used to play when they tended to the cattle. That is how I spent my time until I came to town. I played not to entertain people but to entertain my thoughts. It was like that. The washint is an ancient traditional instrument. Let alone now, even in the times of the old testament washint was one of the great instruments that was mentioned in King David’s time. Masinqo, washint, krar and begena are all traditional instruments. In Ethiopia we also have instruments such as the dul from the south and other wind and percussion instruments. All these are the ancient cultural heritages of our country. So this is what the situation in music looks like. So what is the history of music in and around Gondar like? And how do people use music in this area? In earlier times, people used instruments such as the masinqo, krar and washint. This is because before, if you went into the homes of the nobles, someone who could play the masinqo would praise the nobles, singing to them in wax and gold (metaphors). Then they would take back gifts of cows or oxen and that was their livelihood. The masinqo has rolled over through generations like this. As Gondar was a town with many nobles and “shumamint” (aristocrats), when music was played that glorified them and “stroked their ego” they would give gifts of weapons, cattle, mules, horses etc. This instrument has been used this way through history. Nowadays with modernity and the advance of technology we have television and radio, and even if they still use these instruments, it is difficult to perform in front of people because the hearts of people nowadays lean towards television and films, and not towards the asmaris. In the past, if an asmari was to enter into a place of drinking, everyone would keep silent in order to hear his voice and listen in attention. The asmari would also be given gifts. These days though, even if the asmaris are still the ones recorded, no one pays attention to them and acknowledges that they are the ones. The traditional is being left behind. It is a very useful instrument. The washint is an instrument that was used by cattlemen and shepherds in the night time against hyenas, thieves, and wild animals, and also to ward off sleep. Washint is very popular especially in Gondar, Gojjam and Wollo areas. It isn’t as well known around the south. Washint is an instrument that has great value in Gojjam, Gondar, and Wollo, after the masinqo, of course. Krar also has similar value. This is what the situation looked like. 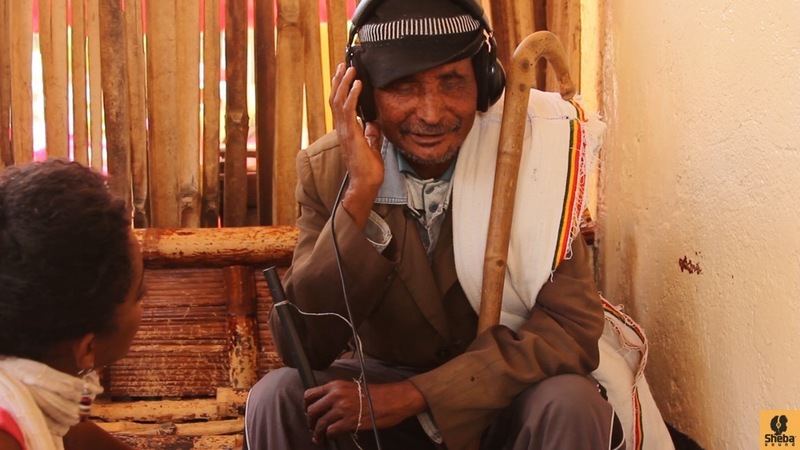 What do you think the level of Ethiopian traditional music is at this time? Especially in the Amhara region? And also if there is anything you want to add? I find it difficult to state the details of this because I do not spend my time in places where music is played. However, I do not see people playing masinqo and washint individually in the town. I hear them playing on TV, in videos, on tape, or on CDs. Of course it is their voices, but since I have not seen them organize themselves in public and play in bars or stages, I cannot really say the level the music is at. If there is anything you want to add that I have failed to mention? That you failed to mention? Well, try to remember and you ask me. I mean if there are any thoughts you would like to share with us. The thought I would like to share is: if you manage to continue like this and go around the country, promoting the culture and heritages, then you are to be admired and appreciated, thank you. And all I can say to you is to be encouraged. This music to where it was before, our fathers, our brothers, and children have left this and passed. The next generation should know these were the instruments we had even before the farenjis (foreigners) created their modern instruments and if you teach steadily so they can reach a stage where they understand this; then thank you very much. This is enough.